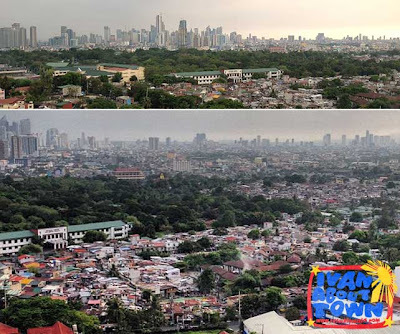 Save Metro Manila's open spaces! We need more green zones and public parks! We were meeting high up a building in Mandaluyong City this afternoon. It's a view I'm quite familiar with. And I've always thought of the "what ifs" every time we meet there since one gets a different perspective of Metro Manila, the full picture if I may say, with views from high above. In front of us was the Wack-Wack Golf and Country Club. Behind us was the National Center for Mental Health. What do they have in common? 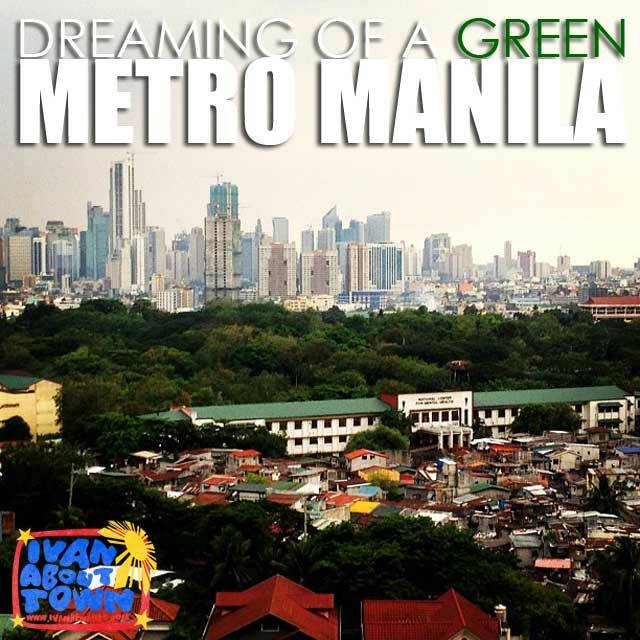 They are among the last remaining lungs of Metro Manila. 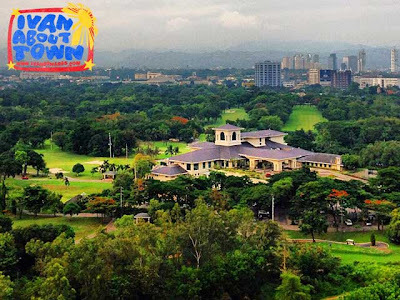 I just realized that many of the few remaining open spaces in Metro Manila are private golf courses and old government facilities. But one thing is certain, we definitely need a public central park! 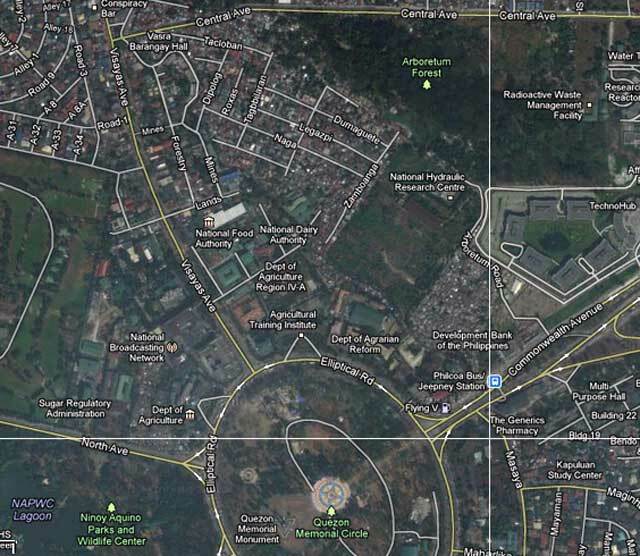 Maybe it's possible in Quezon City where Ninoy Aquino Parks and Wildlife Center (NAPWC), Veterans Memorial Center (VMC), Quezon Memorial Circle (QMC), parts of UP Diliman and LWUA Balara Complex can be connected to form a superpark or greenbelt of sorts. We need more superparks and not supermalls don't you think? When we were being consulted by the office of QC Vice Mayor Joy Belmonte for the Quezon City Tourism Plan just last year, I proposed this idea of a Quezon City Central Park and Green Belt which I was told QC Mayor Herbert Bautista liked. I wonder if there are any updates. As part of the proposal, NAPWC could be professionally landscaped and transformed into a botanical garden that can earn more income from tourists. Note that we don't have a botanical garden in Metro Manila. NAPWC could be connected to QMC and Veterans via an underground pedestrian tunnel. No stairs, just an incline so people can bike or jog under towards the other side. I raised the point of removing all the unnecessary structures at the QMC (such as the unsightly amusement park) and having it landscaped professionally. 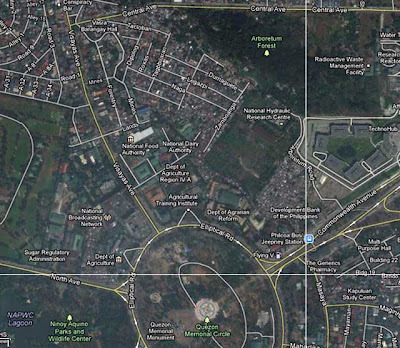 Parts of the Quezon City Hall property could also be integrated in the Quezon City Central Park since there are areas that still have a lot of large trees. 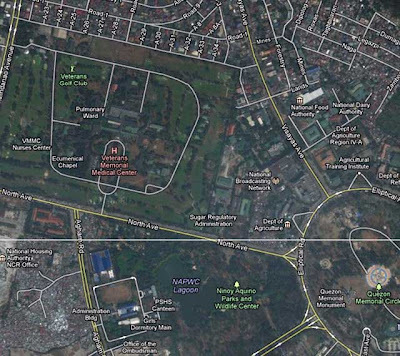 QMC could then be connected by another tunnel and landscaped bike and jogging lanes to UP Diliman Campus. Another set of tunnels and bike and jogging lanes connect QMC to the UP Arboretum Forest through the Agricultural Training Institute and National Hydraulic Research Center. Note again that the lanes have to be landscaped properly! 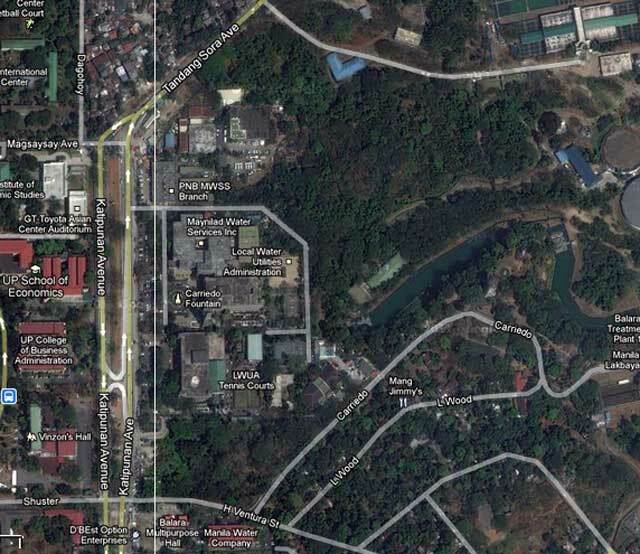 University Avenue used to have beautifully landscaped surroundings designed by National Artist Ildefonso P. Santos, Jr.
UP Diliman in turn could have landscaped bike and jogging lanes to Balara which is also another green zone as you can see from the map. And the Balara facility can be improved in such a way that it becomes a public park as well. Back to Mandaluyong, seeing the large colony of informal settlers in front of the mental health center was depressing. When politicians nurture informal settler communities for their votes, we lose these few remaining open spaces. I was told the property in front, that is said to be owned by DWSD, is about 60 hectares. And it's all informal settlers now. Too bad. If only most of our local officials had vision and were long-term thinkers, that wouldn't have happened. Such a pity also that most efforts are geared towards the next campaign. Who knows, that large patch of green on the property of the National Center for Mental Health might be the next victim of our politicians' bright ideas. Several people informed me that someone did have that "bright" idea of trying to sell the property. But it fizzled out due to strong opposition. 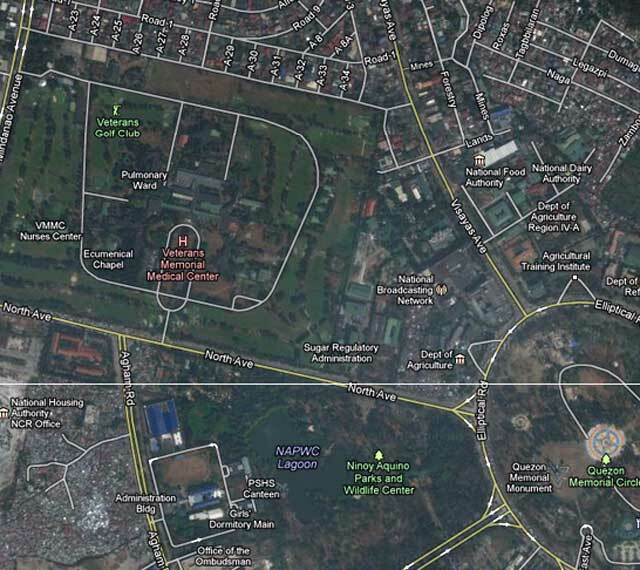 Imagine, if the mental facility is moved elsewhere, Mandaluyong can have its own central park! We don't have much green spaces in Metro Manila left. Aside from those mentioned, in Quezon City there is the La Mesa Watershed (parts of which are becoming residential areas and government officials seem to be doing nothing); Manila has the Arroceros Forest Park; and the Las Pinas-Paranaque Critical Habitat and Ecotourism Area along the coast of Manila Bay (which some idiots in government are proposing for reclamation) are just some of the few green areas we have left. Congress should enact a law prohibiting the sale and conversion of government properties in Metro Manila with significant patches of trees and open spaces. These are all potential public parks. 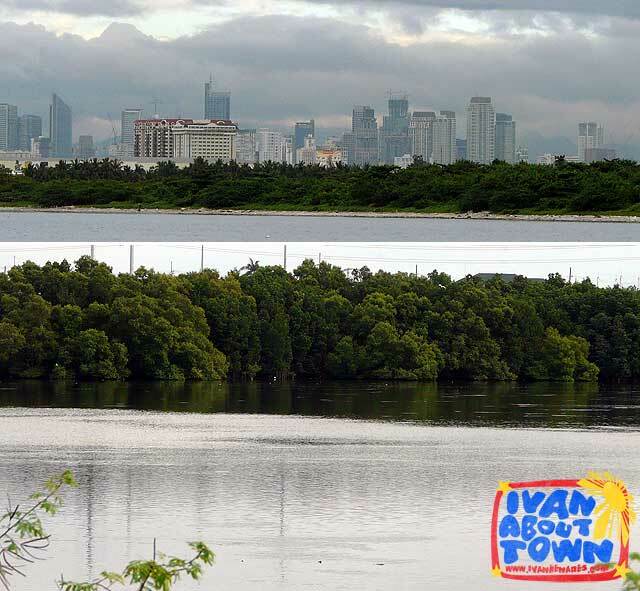 The funds they can earn from selling these land to condominium or mall developers is short-term and pales in comparison to the priceless treasures these open spaces are for raising the quality of life in our cities. We definitely need parks and open spaces now more than we need any additional malls. Our government should give its citizens nothing less. Just visited Singapore and Vietnam, and I'm truly wondering why these politicians who see and admire the cleanliness, the greens and parks of these places, cannot seem to apply it to their own cities. If you go to Europe particularly Scotland you will so numerous parks and playgrounds donated to the city for general public use. The likes of Duthie Park, Hazelhead, etc all beautiful and nice. With corruption and personal gain as the politician's agenda I'm afraid this will just be an idea. Plus of course the high price of real estate. Maybe in the future when new cities are developed consideration can be given to proper town planning and local officials can make sure government land remains for use as forests, parks and playgrounds. I think people should campaign for more green spaces in Manila. I dont want to see another mall, its embarassing! When tourists come to our city its the first thing they comment on, where are all the green spaces, why are there so many malls???? There are 11 million of us here, if we start shouting now, someone has to hear our voice! No more concrete....more green spaces PLEASE!!! True, I agree. More malls please! Hoping Ayala, SM, & Robinson's, Resorts world malls would join forces and funds to give back to the people by building parks around their malls instead of parking lots. I was sad and angry about seeing a generic Sm in tagaytay sprouting up without even a care and consideration to design the mall to suit the location it's built on and about hearing that SM in baguio getting permission to ball hundreds of trees just to build a parking lot... if only business men can look past profits and see that in a few years all their hard earned money can't buy back what was lost. Only when they experience loss of profits or property damage due to landslides, climate change, poor air quality, etc. will this come back to haunt them, only by then it might be late to reverse the damage caused.